My Soul to Save picks up shortly after the action in My Soul to Take - Kaylee is living with her newly returned father, comfortably ensconced in her relationship with Nash and learning more and more about her abilities as a bean sidhe courtesy of lesson’s from Nash’s mom. Kaylee’s quest to save the soul of Tod’s ex-girlfriend Addison takes her deeper into the Underworld – literally. Using her bean sidhe wail, Kaylee can cross the line between worlds and bring others with her, so she, Tod and a reluctant Nash do just that. 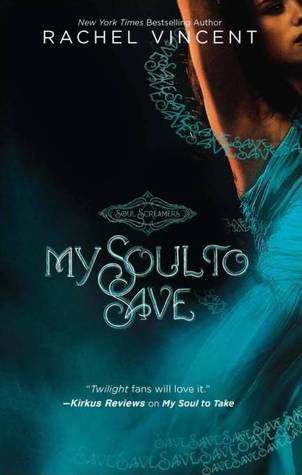 My Soul to Save raises the stakes from the first book which is what I always look for in a sequel. Addison’s plight forces Kaylee to look at things from a less black and white perspective that I found immensely appealing. One of the biggest turn offs for me is a hero or heroine who only deals in goodness and while Kaylee is definitely still the poster child for Good, she’s being forced to accept that the real world comes in shades of grey. There are two really clever aspects to My Soul to Save, one of which is Vincent’s further exploration of the Underworld. The way she describes it reminds me of the movie Constantine in that the demons exist in our spaces, just on a different plane of existence. I’ve read books where the world building is clunky and forced, where it’s obvious that the writer is just trying to be different without putting much thought into the ramifications of what they’re doing. Vincent’s Underworld is not like that. It’s well thought out – especially in the way it connects to our world via places of high human activity/energy. The second aspect that I found absolutely brilliant is Vincent’s not-so-subtle allusion to the Disney Machine that produces packaged pop stars. From Britney Spears to Lindsay Lohan to the Jonas Brothers and Zac Efron, it’s not hard to believe that there are some deals-with-the-devil going on behind the scenes. I love the idea that these kids like Eden and Addison literally trade their souls for fame and fortune and that to break their contract and get them back comes with incredibly high consequences. Much like in My Soul to Take, Kaylee ‘wins’ in the end, but not without cost or consequence. Some are saved and some are lost and she’s left to deal with the fallout. Again, I appreciate that. Tying everything up with a neat little bow is the best way to take the wind out of my sails and turn me off from a series. Now, last but not least, the brothers Nash and Tod. I figured we’d hit something resembling a triangle at some point and while Tod has taken great pleasure in driving Kaylee nuts from the moment they met, it wasn’t until the end of My Soul to Save that I thought ‘aha! Let the triangle begin.’ I’m all for it. I’ve enjoyed Nash and Kaylee, although I’ve continued to be suspicious in regards to his seemingly sudden and unwavering affection for her when all signs and his reputation indicate he’s something of a player, but I’m ready to see what Tod has to offer her. Plus, I’m always, always a sucker for the ‘bad’ boy. I’m very much looking forward to reading the next book in the series - My Soul to Keep - and I have faith that Ms. Vincent will continue to weave a compelling tale.